Drug Channels: Can CA's e-pedigree law be Implemented? Can CA's e-pedigree law be Implemented? Welcome back, my friends, to the enforcement debate that never ends! 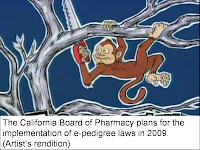 The California Board of Pharmacy (CA BoP) is meeting today to consider the January 1, 2009, implementation deadline for e-pedigree along with the new CA pedigree legislation. (Read the agenda.) Similar to my prediction prior to the last meeting in CA Pedigree: Going to '11?, I think the Board will pontificate about “the industry as a whole” and once again avoid a vote on delaying implementation until 2011. However, I have a new theory for you about why the Board will not be able to implement e-pedigree even if they decline to adjust the deadline. I also have a few connect-the-dots ideas suggesting that the Board is not even planning to enforce anything. If you attend the meeting, drop me a line and I’ll post a synthesis of perspectives. As always, your anonymity is guaranteed. IS PEDIGREE AN UNDERGROUND REGULATION? As you may know, pedigree is covered in sections 4034 and 4163 of the California Business and Professions Code. According to California’s Office of Administrative Law, all state agencies are required to adopt regulations following the procedures established in the Administrative Procedure Act (APA). If a state agency issues, enforces, or attempts to enforce a rule without following the APA, the rule is called an “underground regulation.” State agencies are prohibited from enforcing underground regulations. I’m no lawyer, but California’s pedigree laws still seem “susceptible to interpretation,” a key test for APA procedures. (See What is a Regulation?) The CA Board of Pharmacy is using a great of judgmental discretion in carrying out its duties, as I point out in Pedigree and Obscenity. GETTING READY FOR … NOTHING? 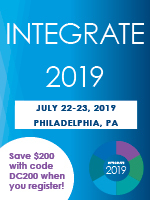 Through my work with Secure Symbology, I have seen first-hand that an integrated serialization/e-pedigree solution can be implemented on a high-speed packaging line using 2-D bar codes. However, many (most?) manufacturers, wholesalers, and pharmacies will not be ready by the arbitrary deadline of 1/1/09. While counterfeit drugs remain an ongoing threat, there seems to be little logical or fact-based rationale for rushing ahead with a law that is still susceptible to interpretation. So, does the Board (privately) expect a delay? Clue #1: The Board of Pharmacy’s budget will increase by only 2.5 percent and they will add no new positions in the fiscal year during which it implements e-pedigree. (See Pedigree and Obscenity.) Huh? Clue #2: Judith Nurse, Supervising Inspector at the CA Board of Pharmacy, spoke by telephone at the SecurePharma conference in February. I wrote down the following quote: “We do not want to be the pedigree police.” Does this statement mean that the Board plans not to enforce the pedigree law? Clue #3: I asked Ms. Nurse the following question at SecurePharma: “It seems likely that many manufacturers and wholesalers will not be able to comply with the pedigree laws by January 1, 2009. What contingency plans has the Board of Pharmacy prepared to handle such a situation?” Ms. Nurse replied: “We have not developed any contingency plans.” If this is supposed to make consumers feel safer, then I’m really worried! According to its own assessment, the CA BoP’s staffing is “insufficient to perform mandated duties at desired levels.” Perhaps that explains why the CA Board of Pharmacy has not yet bothered to post the minutes from January’s Public Board Meeting on the Board and Committee Meetings section of its own website (as of March 24). Guess they need more time to comply. Yes, Dr. Fein, you are on to something with this analysis. Let's see what happens. "We are desperately seeking cooperation from the pharmaceutical industry," he said. "But we are not getting their cooperation" except for certain smaller manufacturers. I respectfully disagree with this assessment, which isn't based in facts and seems unnecessarily inflammatory. "We're so glad you could attend, step inside, step inside....."
Of course, the other tune that comes to mind with this entire saga is the Scottish band Stealers Wheel and Stuck in the Middle with You ... "Clowns to the left of me, Jokers to the right...."
There is a fair compromise with the CBOP, legislators and drug producers for 2009 compliance. The compromise is a supply chain layer called a "compliance intermediary." There is a mechanism to pedigree the majority of prescription drugs, if not all, introduced in California trade with only the addition of 24-96 hours to the supply chain. This would eliminate the need for drug producers to alter their packaging lines and substantially reduce the IT cost impact. Since drug producers compliance formula requires the drug producers to serialize 100% of their production to comply with the needs of less than 10% of their revenue, the cost of the 'compliance intermediary' reduces the overall cost to drug producers and the intermediary assumes the role of maintaining and preserving pedigree data without a minimal need for IT change. The 'compliance intermediary' also acts as a remediation agent to pedigree grandfathered product and also act as a compliance agent to correct point of sale issues of missing pedigrees. The 'compliance intermediary' also acts as the single point of contact for regulators seeking forensic data, and the 'compliance intermediary' also indemnifies the drug producer from liability arising from pedigree non-compliance. No one from our company is attending the CA BOF meeting. The outcome seems clear, so not worth the airfare. (I know that seems harsh, but the overall approach is flawed on so many levels, attendance does not seem mandatory!). FYI, California's e-pedigree situation has made major national news today. The Kaiser Daily Health Policy Report has a summary with links to articles from USA Today, LA Times, and the San Diego Union-Tribune. As the director of Novus Medical Detox, I regularly see the ravages of prescription drug addiction. It is appalling to me that there is an explosion of counterfeit drugs getting into our supply lines and the people who could stop this are avoiding the issue. The Titanic is sinking and they are more concerned with moving deck chairs. 1. 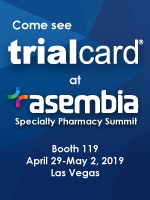 Because both short-term profits and long-term doctor/consumer confidence could be affected, manufacturers will take steps to ensure that true supply chain security is achieved (how many of you really feel more secure while traveling now that the TSA is in place??). 2. The laws that eventually result will be driven by businesspeople, enforceable because they are simple and attainable (21CFR Part 11 and SOX are two relatively recent examples where politicians were "smart" enough to allow affected industry professionals to develop something that worked and THEN create the rules by which the game is to be played). Remember that politicians are simply lawyers looking to ensure their own job security after they lose an election, and write laws for laws' sake, not for people's sake. 3. Efficiency will be built in up front, instead of having to be gained later. Compliance resulting from creativity instead of compulsion is more efficient. Would you rather have a post-Andrew builder in Florida design and construct your home, or FEMA? All this noted, "industry (that heartless behemoth)" will drag "its" feet unless there is an advantage somewhere (remind you of anyone or everyone you know?). One idea might be, instead of hammering the pharma industry with price pressure (we'll buy all of our drugs from Canada without a pedigree to save $500 in the state budget this year...), provide premiums to those companies with an ironclad pedigree. Incentivize compliance, and you get compliance. Compel compliance and you get loopholes. Especially when bribable officials have an open door policy to lobbyists. I suppose I'll get back to work making a solid, safe pedigree happen now. Stay tuned! CA e-pedigree: Going to '11! !